Any time you need to renovate or construct, whether it be in a residential situation, commercial building or infrastructure such as road networks or civil works, there is always an element of digging, and removal of excess soil. What do you do with the excess soil from your project? Well you could recycle it on site, use it to form retaining walls, in gardening or other landscaping ventures but you might not be able to reuse all the excess soil in your own yard or within a commercial setting. When it comes to civil works, these projects are larger and generally the soil is stored somewhere off site before being trucked back to site to use for embankments or other uses. To avoid confusion and delays in project works, it may be easier and more cost effective to simply sell the top soil and purchase new fill when the time comes. Any issues that might arise from removing excess soil is that it is heavy, bulky and certainly messy. You need not only the right digging machinery but also the right vehicles to remove the dirt to another site. Your vehicle is not an effective way of removing large amounts of soil, especially if this is soil dug up to make room for a pool. You and your friends will be there for days simply removing the soil. This can extend the timeline and cost of your project beyond manageable means. 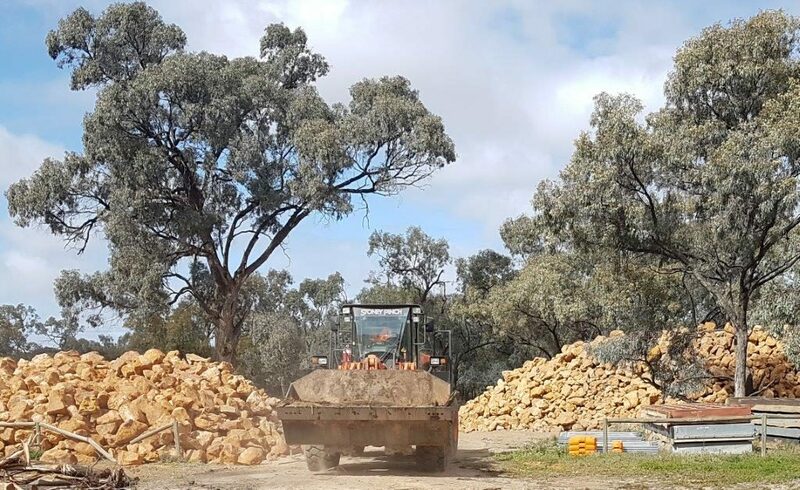 This can be a cumbersome process, so the team at Stoney Pinch Earthmoving put together a few tips for removing excess soil from your site. Remember, we can help you if you have excessive soil on site, and we have all the vehicles and equipment in one convenient place to assist. Once you have dug up the soil for your project, you can use it in other areas around your home or site. The easiest, quickest way of reusing the soil is to pop it in the garden, so not only are you saving on the cost of buying new soil for your gardens, you are completing both projects at once. If your block is steep, or uneven, you can use the excess soil to level out the block a little or use it to fill in garden beds and retaining walls, so they are level or garden beds that jut out from the block increasing the surface area and useable space. Just make sure you find out if the soil is suitable for the plants you are growing. If you cannot use some or all the soil in your yard and gardens, consider selling it. The excess unwanted soil may be needed by others in the area, and you can always request the purchaser collects the soil themselves, reducing the cost to you. Rural areas may have farmers that could put that top soil to use for a reasonable price. This way the soil isn’t wasted and doesn’t simply end up in drains. Other ways to sell include listing the excess soil on selling sites like Gumtree or eBay, just make sure you include all the information possible in your advert to avoid confusion and so potential purchasers know exactly what they are getting. If all else fails, you can seek advice from your local council about where you can take the soil for use in refuse stations or if there is any reason you cannot dump or transfer soil. The team at Stoney Pinch can also help remove your excess soil and depending on the amount of excess soil, we may be able to remove it all in one truck load. We also have several options to load the soil into our vehicles, making us the choice for convenience.